Carrying forward the trned of offering one of the best premium interiors, the new Honda CRVpacks in a combination of premiumness and luxury at one go. With the change in exterior dimensions even the interior cabin space has been changed in order to make the vehicle feel more spacious and roomy.Inside the cabin, the dual tone Sienna Beige interiors make it look plush and fresh. The new CRV offers a One Motion Drive Down Rear seats with a 60:40 split ratio. With the new arrangement, the rear cargo space has been increased and also approaching the cargo space has got a lot more convenient. The seats descend on the actuation of small levers located near the tailgate. Honda CRV Ex Showroom Price in Pune ranges from 21,53,676/- (CRV 2.0L MT Petrol) to 25,47,400/- (CRV 2.4L AT Petrol) .Honda CRV has 3 Variants of Petrol are available in India. 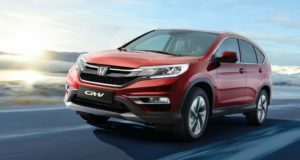 Honda CRV comes in 5 colours, namely Carnelian Red Pearl,White Orchid Pearl,Golden Brown Mettalic,Alabaster Silver Metallic,Urban Titanium Mettalic.